On an April evening in the year 1917, a lawyer named Vallabhbhai Patel was playing bridge at the Gujarat Club in Ahmedabad. This was, for him, a routine affair; every day, after his work at the Bar ended, he headed straight for the card table. This evening in April 1917 was different. Earlier in the day, in distant Bihar, another Gujarati lawyer had been detained for refusing to obey an official order to leave Champaran. As the historian David Hardiman writes, when the news of Gandhi’s defiance of the British Raj reached Ahmedabad, ‘the legal fraternity at the Gujarat Club leapt to their feet’, and decided to have this ‘brave man’ as the next President of their Sabha. No one was more moved by the news than Vallabhbhai Patel. Indeed, he quit his law practice shortly afterwards; and for the next thirty years worked alongside Gandhi, helping him build the Congress, plan and execute various movements of civil disobedience, and in other ways help advance the movement for freedom from colonial rule. Before Patel, Gandhi had himself abandoned a prosperous legal practice to work full-time for the Indian community in South Africa. Their renunciation is well known; yet it came to mind when I read of two senior Congress leaders, both former Ministers, serving as counsel for the All India Muslim Personal Law Board. And it came to mind again when I heard that another Congress leader, a serving Member of Parliament, was acting as the lead counsel for the Travancore Devaswom Board in the Sabarimala case. The AIMPLB and the TDB represent the most reactionary elements in their respective communities. Both are implacably opposed to equal rights for women. And yet, while Sonia Gandhi and Rahul Gandhi talk often of how their party stands for full gender equality, their own former Ministers and serving MPs appear in the Supreme Court arguing that Indian women, Muslim as well as Hindu, should be denied various kinds of rights promised them by the Constitution. What are the words one might use to describe this kind of behaviour? ‘Opportunistic’ is one. ‘Hypocritical’ is a second. ‘Cynical’ is a third. Whichever epithet one finally chooses, one thing is clear; that the conduct at the Bar of these various leading Congressmen is in contemptuous violation of the history and legacy of the Indian National Congress. Gandhi and Patel were not alone in turning their back on legal practice when they joined politics. Other patriots across India did likewise. Chakravarthi Rajagopalachari was as successful a lawyer in Tamil Nadu as Patel was in Gujarat or Gandhi in South Africa. 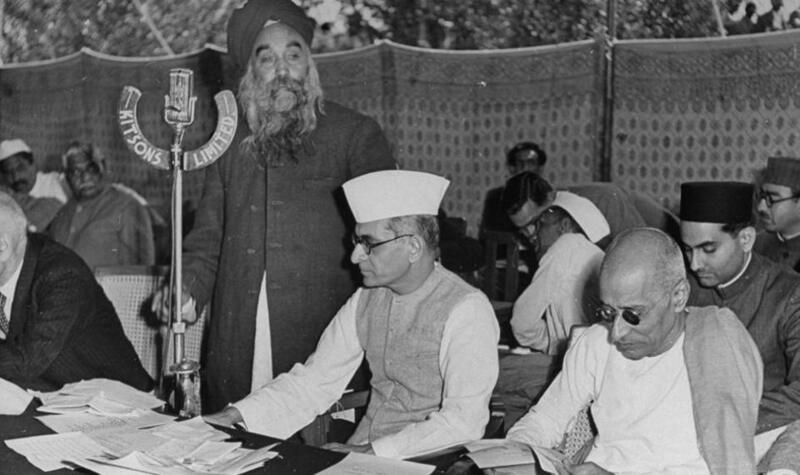 When he joined the freedom movement, Rajaji left behind his practice too. However, in one exceptional case he returned to the Court, as narrated below. In 1925, a Dalit entered a temple at Tiruchanur, close to Tirupati. The temple authorities filed a case against him, as their holy scriptures prevented Dalits from entering a shrine meant for caste Hindus alone. The charge was upheld by a judge who shared the prejudices of the temple authorities. When he read a report of this injustice, Rajaji was outraged, and temporarily abandoned his vow of ‘non co-operation’ with the colonial justice system to appear on behalf of the victimized Dalit. As he wrote to a friend, the persecution and prosecution of this devout Dalit ‘took me out of the mechanical groove of doctrine’. Through his arguments in Court, Rajaji persuaded the judge to overturn his original verdict and have the Dalit acquitted. By this time, Gandhi himself had not practiced law for over a decade. The only occasions on which he had recently been in Court had been as a convicted satyagrahi. However, he entirely approved of what his disciple had done. As Gandhi put it, Rajaji ‘would have been like a Pharisee if he had sat there still, gloating over the sanctimonious satisfaction of non-cooperating, while the accused could have been discharged by his intervention’. Like Gandhi, Patel, and Rajaji, Jawaharlal Nehru gave up the law to join the freedom struggle. Unlike them he was never very successful at the Bar. Yet it is noteworthy that the one time he donned lawyer’s robes as a serving Congressman, it was to defend soldiers of the Indian National Army whom the British Raj had charged with ‘treason’. As with Rajaji, an exception was made for a worthy cause. One would have absolute respect for Congress ex-Ministers and serving MPs if they either (a) entirely gave up private practice and focused on politics: (b) entirely gave up politics and focused on private practice. One would respect them too, if they remained in politics and took up only those briefs that resonated with the values and ideals of the Constitution their party claims to uphold. Yet, where the likes of Rajaji went back to the Bar to fight for equal rights for Dalits, the Congress lawyer of today appear repeatedly on behalf of groups that seek to deny women equal rights. When I first tweeted about the hypocrisy of these Congressmen, their apologists claimed that the code of the Bar Council mandated that they take any brief offered to them. I checked with learned scholars of the Bar; who confirmed that this was not the case. Senior Counsels, which is what these men are, are not obliged to take briefs if they don’t wish to. That they do is a sign of their hypocrisy, opportunism, or worse. It is also a sign of how far removed Rahul Gandhi’s Indian National Congress is from the party of the same name that ex-lawyers like Mahatma Gandhi, Vallabhbhai Patel, Jawaharlal Nehru and Ckakravarti Rajagopalachari once so honourably served.